Welcome to Yukon Stone Outfitters, located in the heart of the Pelly Mountains in the wilderness of south central portion of Canada’s Yukon Territory. We operate Yukon Hunting Concession #15 and this remote area is a special place where everything truly is as the Yukon Territory slogan says “larger than life!”. This legendary Hunting Concession has been owned and operated in the past by some equally legendary guides/outfitters including Belle & Curly Desrosiers, Clay Martin, Randy Babala, and the Watsons. In 2012, mountain hunting veteran, Aaron Florian, purchased the business and is establishing the next era of the outfitting legacy in this concession, and we look forward to helping dreams come true for many years to come. I’ve been a northern mountain hunting fanatic since I was young and it has been a 20+ year dream of mine to own one of the top Northern hunting concessions. After guiding in the western US for over 10 years and taking many trips above the 60th parallel, the north had become a second home. As a lifelong, avid mountain hunter, I've long understood the reputation of Yukon Concession #15 and the unrivaled quality and quantity of game within its boundaries (especially Stone Sheep). The record books are littered with game harvested from this area and I’m delighted to have the opportunity to continue the tradition of hunting excellence that has existed here for many years. Whether you are looking for majestic stone rams, big Yukon bull moose in rut, velvet or hard antlered mountain caribou, or the intensity of stalking a mountain grizzly bear, we have the hunt that suits your needs. 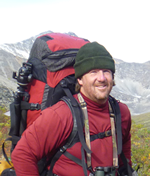 Come join us in the Yukon for an adventure you will never forget!